Collaborative Authorship Training Program is an Online Programme with aim to train young orthopaedic surgeons in the art of writing Scientific Papers as a part of Collaborative Authorship Programme. Important Announcement: The March- July 2012 Batch for Collaborative Authorship Training Program is now full. We invite Applications for the July-Dec 2012 Batch. Phase I – Members who have newly registered with this program will be first asked to write summaries on small topics/ concise reviews. Articles and topics will be provided by IORG Team. Reviewing and editing of the article will be done by IORG Team and the reviews will be Published online in form of a online publication. The IORG member who has worked on the publication will be identified as the primary author of the publication and will be given due acknowledgement. To complete this phase the member has to attend one Basic Course in Research Methodology organised by IORG. Phase II – After Finishing at least 10 assignments (or as decided by IORG Core Committee) in Phase I, the member will be then enrolled into Phase II. Here he will be involved in preparing manuscripts for IORG Updates and also in writing review articles. A team of 3 members who have completed the Phase I will be formed and articles and guidelines will be provided to write a review article. Guidance will be provided by IORG team. These reviews will be published online at various platforms including IORG website, IORG Updates and IORG Journals. Authorship will be distributed among the team working on the publication and final decision will be taken by IORG Core Committee. To complete this Phase the Member has to attend the Advanced Course in Research Methodology organised by IORG. - Members from Phase III will be selected to work as Co-Authors on IORG Research Projects. Here the members will be directly involved in writing a scientific articles under direct guidance of IORG team. The contibution will be acknowledged in form of Co-Authorship in the published Journal Article. Invitation for such endevours and decision on the authorship will be decided by IORG Core Committee. 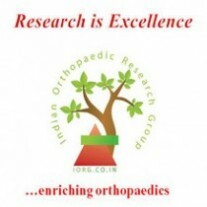 -Phase III Members will also be selected for writing Orthopaedic Literature Updates which will be published online every month and due credit will be given to authors for the publication. -Members in Phase III will also be given official posts in IORG Journals depending on decision of IORG Core Committee. -Members in Phase III will be called as speakers for IORG workshops and conferences as per their expertise. In Phase III Members will be ready to take on their own projects and write their own papers. We feel this Phase wise progression will help a great deal in step by step training of the orthopaedic surgeons in art and science of Good Clinical Writings and will help in building up confidence in the members when writing scintific Manuscripts. Also since this programme is not time bound, it will help surgeons to select appropriate time which they can dedicate to the work. Guidance from IORG team will help in developing the correct way of writing and preparing Journal Manuscripts. No fees will be involved in this programme and the progress of the member will directly depend on his interest and excellence in research. The above terms and conditions are subject to change and IORG Core Committee reserves all rights for selection of members, articles and authorships. - I Dr _________________________ wish to apply for inclusion into IORG Collaborative Authorship Programme. I have read and understood the terms and conditions and am ready to comply with them. I understand that decison of IORG Core committe will be final in terms of selection of topics, articles and authorships.